Now Cooking Salon Inwei is temporary closed....will be reopened in spring 2017. We provide Japanese private cooking class in English in Tokyo. From Japanese daily home cooking menu to party menu, you can learn varieties of Japanese recipes. At the same time, of fourse, you're able to acquire basic skills of Japanese cooking. 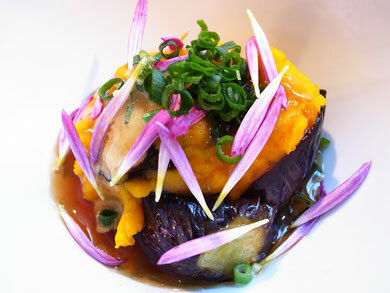 We hope we could introduce you the deep essence of Japanese cuisine ! First, please let us hear your request and basically, we build up lesson plan with you including menu and time. 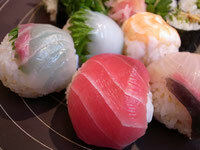 Example 1 : Sushi class includes Temari Nigiri Sushi and Roll Sushi. Besides sushi dishes 1 seasonal appetizer, 1 meat or fish dish and Miso soup are also included. 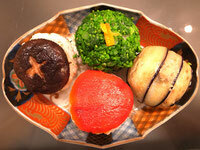 Example 2: Vegetable Sushi class includes Vegetable Temari Nigiri Sushi and Roll Sushi. Besides Sushi dishes 1 seasonal appetizer, 1 Tofu main dish and Miso soup with vegetable stock are also included. We are able to provide varieties of menu from traditional to modern Japanese dishes. We also have varieties of vegetarian menu. As a gift, everyone attends our class can have our special recipe book which has all the recipe on our menu. Optional service such as Tsukiji market tour or Japanese sweet lessons are also available. Reservation is required for each class..
1 person : 15000 Yen. Salon is 5 minutes by walk from Gakugeidaigaku or Denenchofu station. For more information, please check "Lesson Shcedule". If you have any questions, please conact us.